What advice would you give to this friend who wants to get clued into local and younger artists in her (Chicago) neighborhood? "I’d like to start filling our empty wall spaces with some stuff that we could pass on to our kids some day- not because its valuable, necessarily, but because it’s part of our family history. But my question is…how? I am willing to save up a little to invest in something we really love- but I’m not interested in (or in a position to) drop several grand on a traditional oil landscape, you know? I would love to find something a little more modern, or by a younger artist…but I frankly don’t even know where to begin. Go check out galleries in the edgy hipster part of town, where I’m sure to feel like a poser but maybe I’ll find something fun? Look online somewhere?" First. Things purchased to match your home are decorations...not art. (My opinion) Although they could be both, most often when approached from that direction, they are not. Second. Please buy original art created by a person. Giclee' is a French word for Expensive Poster. There is nothing better than having something in your hands that was created with love, passion, sweat, thoughtfulness and sometimes the blood of another person's hands. So with that in mind here are a few things to consider when starting your collection. Look for original art that you can afford. There is good art at every price level. Please do not negotiate with an artist over his/her price. There is often very little, if any profit margin built in. (Galleries are a different story). Don't worry yourself over what is "good" art or not. Look for open studios or perhaps an art fair. I'd stick to the less crafty one's. Talk to the artist. Often times there is a story that enhances the painting or helps you to understand it better or identify with it in a way not immediately evident. Find art that appeals to you. If you're looking for longevity consider buying from an established artist or one who makes art as a profession, not a hobby. Art as investment requires some risk, so like with any investment do your research. A collectible artist is sure to have a sales history or the potential for one. You could be their first sale but it's not likely. Go to gallery openings. It's a great way to see what's out there and to meet artists and collectors. Talk to everyone. There is a tremendous markup on art at galleries but that is not all bad. The galleries establish the value of the artists work. Example: If Joe Artist is represented by a gallery selling his work at ($x2). That is the value of the piece. Joe is obligated to sell other works outside of the gallery or with other galleries at a comparable price. Undercutting one of the galleries would devalue all of his work even the pieces that have previously sold. No one would buy work from a gallery that they know can be purchased directly from an artist for a fraction of the cost. This in turn would cause the gallery to sever its relationship with the artist. In most cases that would cut the artist off from access to the large collector list that the gallery holds. The lack of representation in some ways discredits the artist as well. It is in the artists best interest to maintain that relationship with the gallery. Now, why buy art at twice the price that the artist is paid? For that markup the gallery does several things. Most importantly... brings potential customers to the artists work. Throws a big party for him/her. Negotiates on behalf of the artist, Follows up with patrons, former patrons and much more. 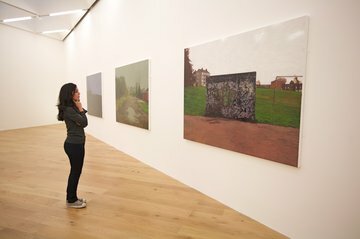 In most cases, depending on the reputation of the gallery, art that makes its way onto the walls of a gallery has been "pre-qualified". Most potential art buyers admittedly know nothing about art. Gallery owners are not always the best resource for this either, however they know what they can sell and to whom. For those reasons, they take the gamble for you, somewhat reducing your risk. The bottom line is you have to enjoy looking at the piece. It has to affect you somehow (make you happy, make you think, make you remember something, or someone, etc). If it's only quality is that it matches your decor, then it too will soon go out of style. When addressing your other concern of passing the collection on to your kids, consider this. Who would want to receive someone else's dated furnishings that aren't heirloom-worthy? They are likely to be sold, trashed or given away with the aforementioned matching sofa. Do you have any tips that you'd like to share? Please comment with your thoughts on collecting art and/or how you started building your collection. Ohh.. the usual blurb here about how I brood and suffer for my art. I'm a painter and an artist. Always have been. Always will be. What else 'you wanna know?